Detroit in the industrial age: more than automobiles. In addition to automobile production, the city was a center for stove manufacturing, pharmaceuticals, and tobacco and cigar company growth. The tobacco industry grew simultaneously with the rise of Polish immigration to the United States. When Polish-Americans became the city’s largest ethnic group by the time of the 1920 U.S. Census, the cigar industry had also become the city’s third largest industry by number of people employed. The relationship between tobacco production and Polish women became so strong that some cigar factories even relocated to Detroit’s east side. This area was home to the city’s concentration of Poles, and included the Chene Street neighborhood. As this tie continued strengthening, workers would encourage relatives and friends to begin work in the cigar industry. Polish became the common language of conversation on the factory floor. By 1937, six cigar factories occupied a four square mile area around the streets Milwaukee, Grandy, St. Aubin and Warren Avenue. According to HistoricDetroit.org, the ten largest cigar producers employed 302 men in 1913. In contrast, these same companies employed a total of 3,896 women, making tobacco production the largest employer of women in the city. In addition to unfair compensation between the sexes, there was also no formal training period for new tobacco employees. New workers learned on the job, and it was standard practice for companies to withhold all wages for the first six months until an employee was performing to par. If an employee quit for any reason before this period was over, all income earned was forfeited. Securing a job was the first of their worries. Workplace conditions of the cigar industry were almost unbearable. Workers.org describes these circumstances: "Toxic tobacco dust was always in the air, with ventilation poor to nonexistent. The few available toilets were of a primitive type or, if modern, dirty and often broken. The factory owners provided no soap or hot water. Sexual harassment from foremen was routine." Further aggravating factory conditions was the economic disaster of the Great Depression. Following the 1929 stock market crash, cigar worker's wages were cut from 35-50%. The salary of women in the cigar industry was among among the lowest in all of Detroit. Men in business leadership positions hired women because they worked for less compensation than their male counterparts. But some men found the presence in any woman in industry to be a double-edged sword. Kessler-Harris also cites examples of men's fear of losing their jobs to women. Newspapers had a role in rationalizing and spreading this fear. A Newark Star Eagle 1925 reads, "AWAY GOES ANOTHER MAN'S JOB," in response to a woman becoming the secretarial assistant to a senator. This internalized fear justified management's decision to pay women less--it disincentivized them from permanently staying in the workforce. Why was it acceptable, legally, culturally, and historically, to pay a woman less than a man in the same occupation? Women were not expected to have long-term careers in production industry. Many single woman workers quit their jobs within 2-4 years in order to get married, maintain a household, and raise a family. In turn, these short-term female workers never qualified for a pension, paid vacation, or other job benefits that come with seniority and experience. I was not able to recover any documentation of disciplinary action taken against women who participated in these acts. Therefore, it is plausible that tobacco management never became privy to these silent methods of rebellion. Types of worker protest such as this was only the beginning to a period of women’s labor activism in Detroit, spurred by the unfair labor practices of the city’s chain of cigar factories. Lacking a union, with no means to negotiate wages, the women had attempted to ask management for a 10% raise. But their concerns were never addressed. 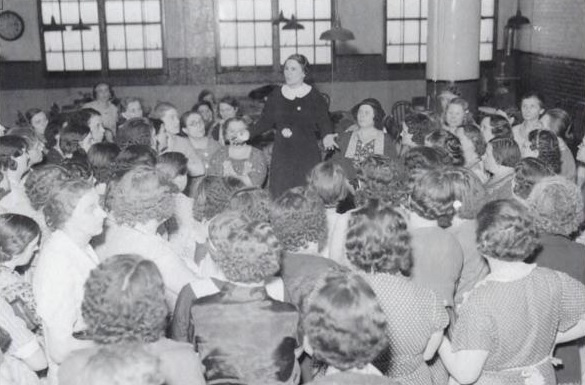 Five days after a successful General Motors plant occupation in Flint, MI, women of the Websten-Eisenlohr cigar company put a plan in motion. This strike was a part of a string of labor activism that began diffusing at quick rates during the early 20th century throughout industrial cities. Goals of the cigar strike included union recognition, a protest of working conditions, and demands for higher and fair wages. Leaders of the strike put up a notice on the bulletin board in Polish announcing the protest, and on February 16, 1937, the women laborers conducted a sit-in. Workers.org reports, "In a matter of days the five other cigar companies — Mazer-Cressman, Essex Cigar, Bernard Schwartz, Tegge-Jackson and General Cigar — were also occupied. The women garnered widespread support from the UAW and other Detroit-area unions, as well as local businesses that provided bread, sausage and other food items." These women had caught the attention of the media and the community, who were supportive of their efforts. The combined strikers from the different cigar companies held a mass meeting at the Dom Polski hall and coordinated a march that would involve all six factories. The Dom Polski was a cultural and organizational center for Poles in the city, traditionally dominated by men, so it is significant to note that these women were able to occupy this space for their own labor and economic agendas. In fact, during the strike, husbands, fathers, brothers and sons all found themselves taking on tasks that were usually a woman's responsibility, like child care, housework, and gaining support outside the plants. Early corporate succumbers were Mazer-Cressman and Essex, who agreed to the women's demands in early March. But the strikes against the remaining four factories continued into the of March, and Mayor Frank Couzens ordered a breakup. Police force was employed against the women, with notable violence. Policemen dragged women out of the factories and injured a few. This enforcement was similar to the experience of the Flint occupations that occurred before the cigar strike, and illustrate a pattern of police response that was not appropriate to citizens' peaceful protest. The United Auto Worker's union was quick to react to this incident, threatening an automotive-wide strike if police brutality continued. UAW champion Victor Reuther announced his famous two-for-one plan: two new plan occupations for every one eviction of a striker. (1.) Grevatt, Martha. "Immigrant women beat cigar company bosses." Worker's World. Accessed November 10, 2014. Immigrant women beat cigar company bosses. (2.) Historic Detroit. "San Telmo Cigar Manufacturing Company Plant No. 2." Accessed November 0, 2014. San Telmo Cigar Manufacturing Company Plant No. 2. (3.) Jackowski, John, and Clara Jackowski. Chene Street Project. MP3. Interviewed by Marian Krzyzowski. Detroit, MI: Institute for Research on Labor, Employment, and the Economy, 2002. (4.) Kessler-Harris, Alice. Out to Work: A History of Wage-Earning Women in the United States. New York: Oxford University Press, 2003. Accessed November 10, 2014. http://books.google.com/books?id=fzIgv1DxZG0C&printsec=frontcover&source=gbs_ge_summary_r&cad=0#v=onepage&q&f=false.